I must admit I haven't done any quilling in the last week, and not much in the last couple weeks; don't know if it's the heat here that's making me not want to do anything. It's been so so hot here. The past two weeks have been around 100˚ every day; and the two months prior to those were in the mid 90's; I'm so over the weather. I cannot wait for fall. 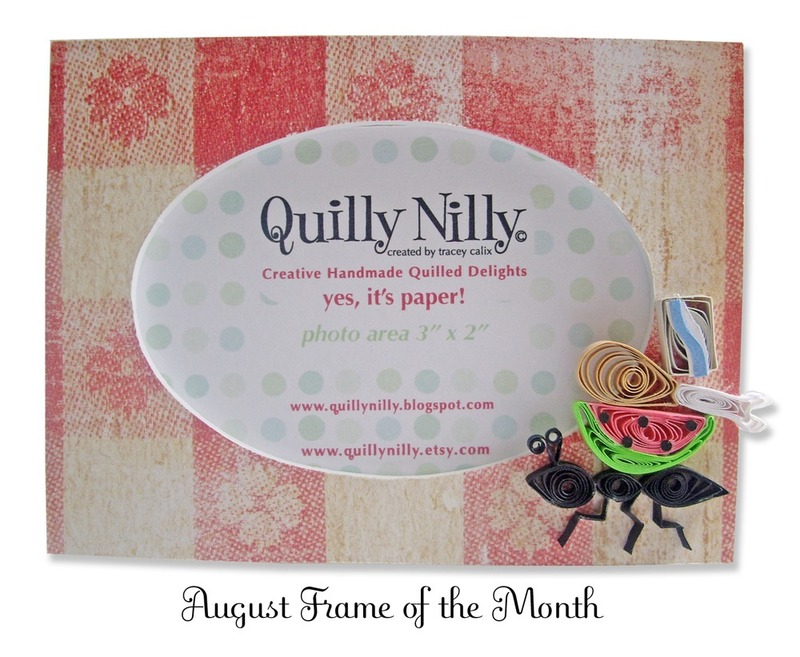 I did however make a cute little frame for August, and I'm feeling a little creative so I may get some stuff done this weekend. I know I have a custom order for a little girl head and snowflakes to finish and I may try to squeeze out something new and will let you see if I do. Have a great Friday! This is adorable. Even the background paper is picnic-ish!. I can't believe how well and symmetrically you squeezed the bones for the chicken leg!! This is too darn cute, Girlie! So fun and creative. Stay away from the heat ~ it's a killer! This is so cute! I love the little ant carrying off all of the picnic goodies! I am with you on the heat! With the same temperatures as you and with no air conditioning and in a very small apartment, I am SO ready for Fall! It is so difficult to work when it is too hot! Wishing you a good weekend with some relief from the heat!